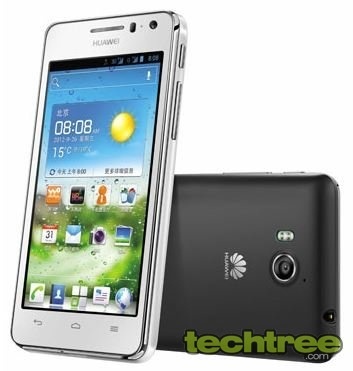 Huawei has announced the Ascend G600 running Android 4.0 (Ice Cream Sandwich). The 3G smartphone sports a 5-point capacitive 4.5" IPS screen with qHD pixel dimensions of 960x540 protected by Corning Gorilla Glass. Being an IPS panel, you can expect wide viewing angles without noticeable colour distortion. 2G GSM (850, 900, 1800, 1900 MHz), 3G (850, 900, 1900, 2100 MHz). 4.5" IPS screen with pixel dimensions of 960x540. Dual-core 1.2 GHz CPU, 768 MB RAM. 4 GB ROM, microSD card slot for expansion up to 32 GB. 8 Megapixel autofocus camera with BSI and dual-LED flash, records video at 480p@30 fps. 0.3 megapixel front camera for video chatting. Wi-Fi 802.11 b/g/n, Bluetooth 3.0, Micro USB 2.0. GPS (with A-GPS), Compass, Proximity sensor, FM Radio. 5.3" (l) x 2.65" (w) x 0.4" (10.5 mm) (d). While it is highly unlikely, we have our doubts about Google Play support for this handset because the product page advertises about the inbuilt apps and games, but makes no mention about the possibility of downloading and installing new ones. It is also mentioned that the handset features two speakers with Dolby DTS certification. The Huawei Ascend G600 is available for pre-order at a price of Rs 15,000 and is expected to be launched on 25th January, 2013. At its current price, this seems to be a decent buy for a mid-range Android phone, but it would have been better if Huawei would have promised a Jelly Bean update, which it does not. Currently, this phone has only a few 4.5" competitors with similar features, such as the recently launched Salora PowerMaxx Z1 and the Byond B63. Both are dual-SIM smartphones, and the Byond B63 comes with Jelly Bean. Since Huawei is a better known brand, consumers can be expected to have more confidence in its handsets. Also, we think that the 768 MB of RAM will help make things smoother than the 512 MB offered by the other two phones.